Well, my father came in town for Christmas... and as always... some fishing. Only problem is the weather has gone to pot. Well, we went out late this afternoon after I got off work and after the rain ended. We tryed a few holes I haven't hit yet this Winter. The bite was definately slow due to the bad weather but we found a couple spots holding trout. We only had a couple hours to work them but managed to land 7 speckled trout with the largest at 4lbs 5oz., 1 small striper, and a flounder before the sun went down. We caught most of our trout on 4in. 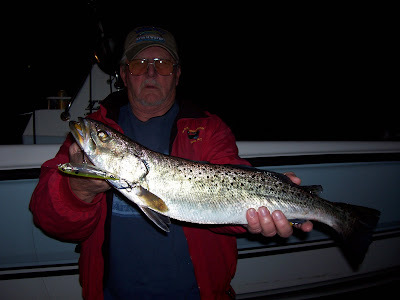 Berkley Gulp Pogies but our largest trout struck an 1/2oz Xcalibur Jimmy xj411 4in. topwater plug in Chartreuse Sparkle. Great Job today Dad! 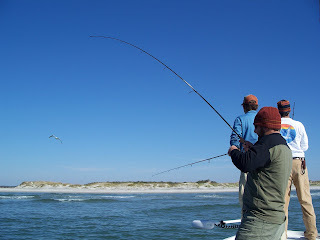 12/24 Trout,Reds,Black Drum, and small Flounder! This morning was absolutely gorgious with daybreak temps about 50 degrees and a very light breeze. Dave Preo and myself worked Bogue Sound and Queens Creek with 3in. Berkley Gulp Pogies for a while this morning. We found a variety of fish throughout the day and managed to boat another inshore slam today. We wound up releasing about 30 speckled trout and kept 7 with the largest just under 2lbs. We also got into some small puppydrum and released about a dozen. 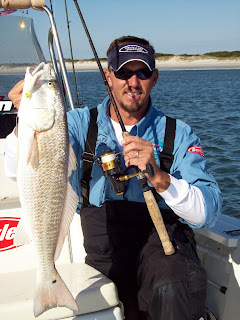 Dave also hooked up and landed two black drum. We finished up the with a small flounder and headed back to the dock. Great day on the water! Thanks Dave. Enjoyed fishing with you today. Merry Christmas Everyone! 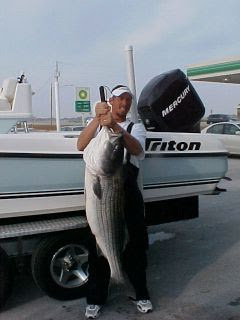 12/22/07 Foul Weather Inshore Slam! Well, with a 20mph NNE wind blowing before we stepped on the boat... it was obvious today was going to be a tough one! 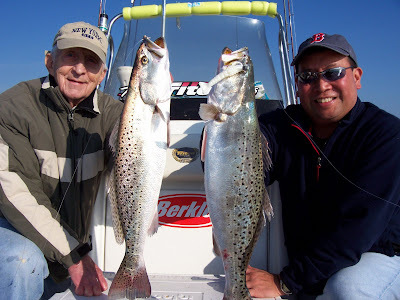 Both Jim and his son Brian P. have fished the Bogue Sound area before and were hoping to get on some decent fish. 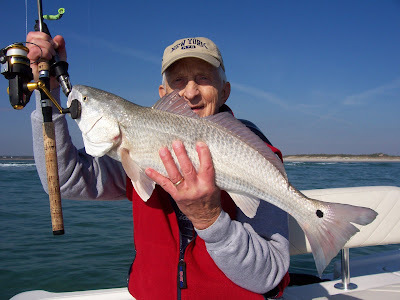 Our areas to fish were limited due to the weather but we tuffed it out all morning fishing Bogue Sound, White Oak River, and other areas around Swansboro and managed a good no. of fish. We just were'nt lucky enough to put up some good sized fish though. We managed to land about 20 small (10 to 14in.) trout, 14 puppy drum, and a decent 1.5lb flounder. 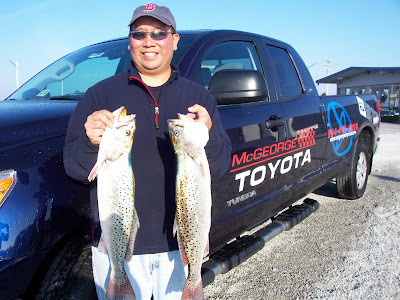 The only two nice trout (about 2lbs) we hooked managed to shake the hook on the way to the net. If the wind will lay back down we should be able to get on some better trout and large schools of Redfish. Thanks guys and great job today! 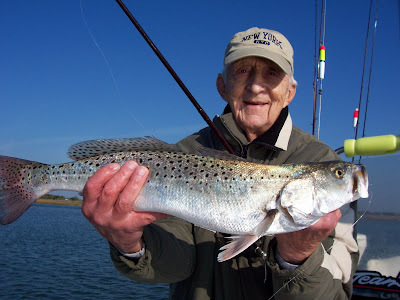 WINTER AVAILABILITY: Trout, Striper, and Redfish! check out the video below for a look at the action the winter offers! Hello Everyone! Well, My wife and I are slowly adjusting to the needs and demands of our new addition to the family. With that said, I'm running a tight schedule throughout the rest of the Winter. Below are the dates I've still got open between now and March. As more dates come available I'll post them. 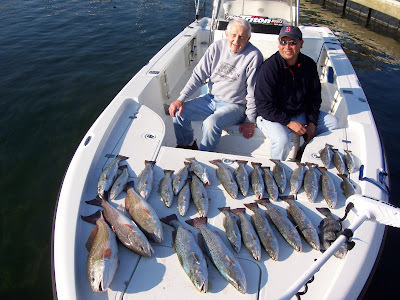 If you're curious what to expect for Jan-March fishing... click on the fishing report section and scroll down to Jan, feb, or march of 2005, 2006, or 2007 and check out the pics and reports. 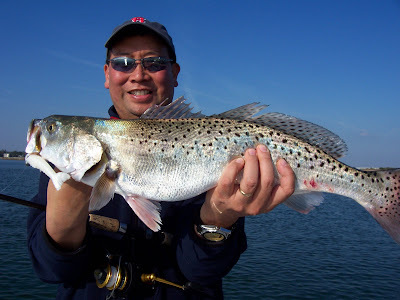 This winter should provide some good opportunities for Speckled Trout fishing. We've currently been catching good numbers of 1 to 3lb trout with some citation sized fish mixed in. 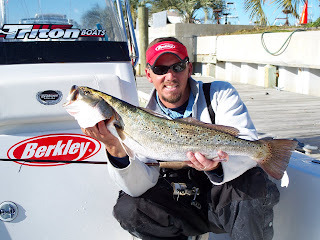 Typically, January is one of the best months for Citation trout of 4 to 8lbs around the Jetties along the NC Coast as well as some local creeks. If the cold weather that occurred the past few days in the Northern States continues we can expect a good Striper run the end of Dec. and the month of Jan. here around Cape Lookout. 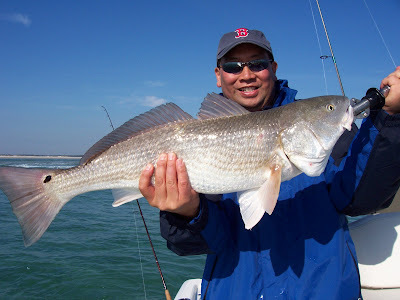 The rest of this Winter thru March should provide some the best sightcasting to Redfish that occurrs the entire year. Aboard FISH'N4LIFE we'll be tossing Berkley Gulp baits to large schools of 100's to 1000's of 20 to 35in. Redfish. It's typical to head back to the dock with wore out arms and some amazing video and pics of crystal clear water and fish sitting head to head! These dates will be gone quick so call (336-558-5697)(910-326-7512)or email me at jcronk@ec.rr.com to book a trip. 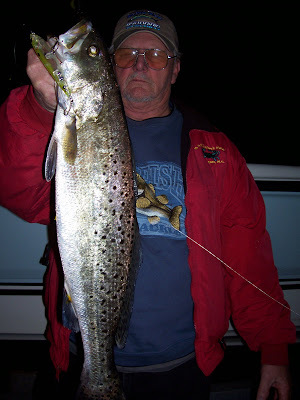 There are several other captain's in the area that I can get you hooked up with if I can't accomodate your desired date. 12/8/07 5.1lb Trout- 3 Limits - 50 Redfish- Black Drum!